By definition fly fishing is an interactive, manual-intensive form of sport fishing that involves casting, presenting and maneuvering an artificial lure—in this case a “fly”—over a body of water in order to attract and hook game fish. Fly fishing is also an equipment intensive sport of reels, creels, rods, floating and sinking lines, waders, vests, special clothing and of course, flies— there are thousands of patterns. Although you can fly fish for any kind of fish, from bluegill to blue marlin, the most popular species of game fish for anglers is trout. Why? Trout are a cold water fish that feed predominantly off insects. Their wading-accessible streambed habitat and ability to put up a hell of a fight on fly rod and reel when hooked are an irresistible combination. But what also makes fly fishing for trout so popular is not its ease, but its difficulty. In a word, trout are not an easy fish to catch. Trying to hook them with a fly makes the process even harder. Are Fly Fishermen Especially Gifted? Bass fisherman who take pride in their spinning rods, bass boats and spinner baits are for the most part, keenly aware of the difficulties and mysteries inherent in fly fishing. They tend to steer clear of trout streams and they may sometimes view fly fishermen as “elitist.” After all, if you’re good enough to consistently land trout in any weather “on the fly” you must possess some special God-given talent. Fly fishing isn’t a sport relegated to just a few elitists or experts. It’s neither an exclusive fraternity nor sorority. It’s an ecologically sensitive outdoor sport that supports the “catch and release” creed and that can be learned and enjoyed by anyone who loves to fish. The first thing you’ll need is the right equipment. In fact, acquiring the right fly fishing tackle and clothing is the easy part. All you have to do is head to the local mega sports store, consult with the in-house fishing guru, pull out the Visa card and “voila!”, you are now the proud owner of some serious fly fishing equipment. But what isn’t easy is stepping into the middle of a cold brook or stream for the first time, positioning yourself right beside a half dozen fly fishing experts who properly maneuver their fly line while you helplessly slap at the water scaring and scattering every trout within a twenty-foot radius. When it comes to the articulate if not complicated world of fly fishing, what can seemingly start out as a well intentioned “new adventure” can quickly turn into red-faced humiliation. If you want to seriously consider becoming a fly fisherman (or woman), it pays to learn some fly fishing basics before you drop even a dime on those super lightweight Neoprene waders or custom bamboo 7-weight fly rod. 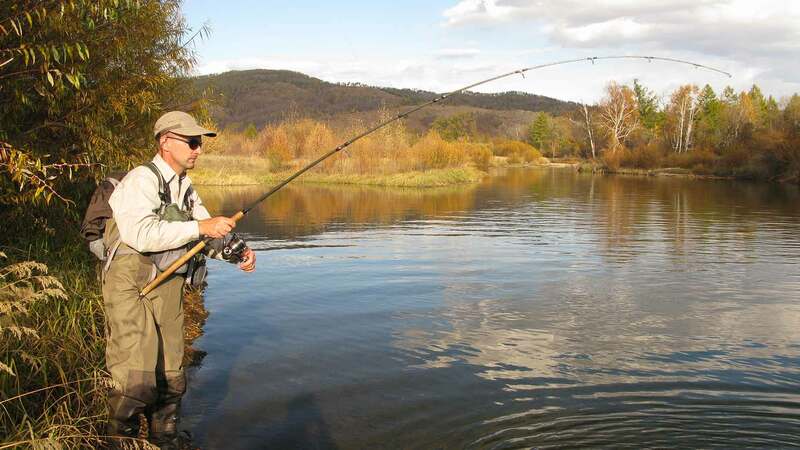 Instead of going it alone, get some instruction by attending a reputable fly fishing school. Located throughout the country in areas where fishing waters are accessible, fly fishing schools—“trout catching” schools in particular–offer one and two day packages that not only provide all the fly fishing equipment rentals you need to get started, but also include hotel rooms and gourmet meals. Even though your mouth may be watering at the thought of hitting the river, certified instructors will first lead you into the classroom for an education in fly fishing tackle, including reels, waders, vests, rods, the various lines, their weights, their floating or sinking properties, plus monofilament leader and tippet attachments. You’ll talk knots. Lots of them– from the Duncan Loop to the Improved Clinch knot. You’ll learn everything you need to know about which knots to use with which lines and which flies. Once you’ve grasped the basics of tackle and knots, you’ll go outside for an introduction to fly casting techniques. That is, you’ll learn the basics of how to coordinate your hand, wrist and rod not only for properly picking up the line, but also for the all important forward and back-casting presentations. You’ll receive instruction on how to choose the proper flies for any given stream under any given weather condition or season. You don’t learn how to tie flies here. But you do learn how and when to make the decision between a wet fly (one that sinks below the water’s surface) and a dry fly (one that floats on the surface). You’ll also become adept at reading the water, including where to seek out the big fish. Once you know where the fish are hiding, you’ll be ready to handle the essentials of hooking, landing, and then safely releasing the fish back into the water in order to preserve their delicate population. Over time, you might become so learned at the sport, that you’ll stop traffic just by the skill displayed in your cast. No matter what your fishing future holds, one thing is for certain– you will never forget your first fish. When a trout suddenly breaks the surface and swallows the fly, the rod pumping and alive in your hand, the reel screaming as the fish steals feet after feet of fly line, you’ll never look at a spinning rod or spinner bait the same way again, because now you’re a fly fisherman.